#1 is a pretty piece of Flint Ridge Flint from Ohio, hafted to Maple Burl with a live edge. A very simple shape for the handle to let the burl shine! #2 is similar to above, but features Indian Jasper for the blade. #3 will go into my ‘keeper case’ since the blade is knapped from Tallahatta Quartzite (lower Alabama)...a very chalky, difficult stone to work. In fact, this represents the best point I’ve made so far from the material in SEVEN+ years of trying! Handle is shaped from Che-Chen. #4 is a striking knife which was difficult to photograph. The blade is from a man-made material sold as Opalized Glass, and has a subtle beauty which can hide depending on background color, and the even prettier handle is made of stabilized Box Elder Burl…tinted, of course. #5 is made from un-obtanium all the way! The blade is man-made Fulgurite from the Space Shuttle Project! Huh? Fulgurite forms naturally when lightning strikes sand…cooking the material into glass…well, this blade started out as sand that some NASA contractor used to form molds for the Space Shuttle tiles. The tile material was so hot it cooked the sand into beautiful and RARE scrap! The handle for this guy is shaped from stabilized Black Palm…kinda matches the black spots in the blade, I thought. As usual, all blades were hand-knapped by me. 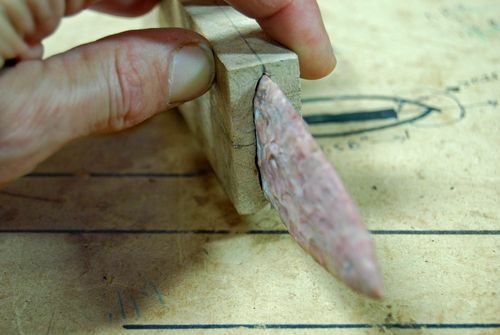 I use modern copper tools, but ancient techniques in chipping the stone. All handles are finished simply with wax. Great work, these all came out very cool. Absolutely gorgeous. If youre selling, please pm. Wow Terry, they look great. The last one is my favourite. Awesome little knives, interesting stories behind them too! beautiful knives, very unique. have you ever used deer antler to knapp with? Very nice job, love these. You make it look easy. bowtie, yes, I’ve knapped with deer antler…and moose! But, organic billets are more difficult to use, 5-10 times the price, and are affected by the weather. humid days render them useless. Deer works OK for small rocks, but moose is really needed to work larger chunks…and a good piece of moose can run $75! Nimkee Joe…nice to meet you…glad to hear your kids chip! I try to show the younger generation how cool knapping is when I can…they don’t wanna hear how important it is. :-) keep up the faith!!! Perfect choices of the wood to compliment the blades, Terry. You did a great job! Any good resources on learning how to knap or chip? Fantastic work. I like them all. The maple burl on #1 is beautiful. -- .......now cut that out! Sam, an excellent book to read is DC Waldorf’s ‘The Art of Flintknapping’. It can explain some of the basic principles and get you started. But, honestly, knapping is so difficult to grasp you really need an experienced teacher to flatten the learning curve. High quality chert is important when you are learning, best and cheapest at knap-ins. Don’t try to use rock you find lying around on the ground…the natural freeze-thaw cycle makes it useless for knapping!